As I nestled a warm cup of coffee in my hands and sat back in my chair, looking at the herd of zebra that had come to drink water… I couldn’t believe that I was still on this planet! Such beauty and peace was too good to be true. Well, it’s no wonder why Kenya is called a dream travel destination and why travelers from all parts of the world keep coming back. 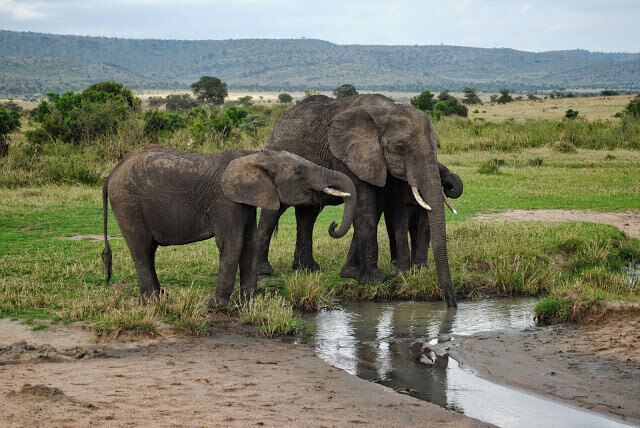 You can never get enough of the pure rugged beauty of the landscape or of the majestic creatures that roam the lands or of the smiling faces of the locals as they shout out ‘Jambo’ (‘hello’ in Swahili). Our trip began in Nairobi, the capital of Kenya. ‘Nairobi’ derived from the Maasai phrase ‘Enkare Nyirobi’ means the ‘place of cool waters’. Think Africa and images of the sweltering heat and vast Savannah plains first come to mind. But Nairobi situated at an elevation of 5450 feet above sea level, is a hill station and a rather big one at that. The weather is pleasant throughout the year and it does get rather chilly during the winters. Indians form a size-able part of the local populace. Under the British Rule, Indians were taken to Kenya as bonded labour to lay the Kenya – Uganda railway tracks. Many of them stayed on in Kenya and eventually set up a variety of successful enterprises. Over the years, Kenyan – Indians have contributed notably to the trade and commerce of the country. Further, with the United Nation’s African headquarters located in the city, there is a huge expat population that has added significantly to the culture of Nairobi. Hip cafés and boutiques, owned and managed by expats are commonly found across the city. Our first encounter with wildlife began at the elephant orphanage run by the David Sheldrick Wildlife Trust, a place where abandoned elephants and rhinos are brought and taken care of till they can return to the wild. An endearing sight was that of a baby elephant as it came charging down eager to drink from a gigantic milk bottle. As we were leaving the park we came across our first giraffe. Much to the amusement of our driver, we were thrilled at seeing a giraffe out in the wild – a lone animal roaming the grounds. Like all Kenyans, our driver – extremely proud of his country’s wildlife, told us that this is just a precursor and that a great adventure awaits us. Ol Pejeta conservancy situated between the foothills of the Aberdares mountain range and Mt Kenya was our first pit stop in our Kenyan itinerary. As we made our way out of Nairobi we passed through lush green farmlands dotted with banana trees that eventually gave way to coffee and tea plantations, that gradually rolled out onto flat golden plains. Such drastic changes in landscape within a span of 20 minutes is hard to imagine, but well welcome to Kenya… the land of the unexpected! Sweetwaters Tented Camp one of the five accommodation options available within Ol Pejeta was one of the finest we experienced in the country. Located right beside a watering hole, we just had to poke our heads out of our tent to come face-to-face with zebras, rhinos, giraffes, buffalos, warthogs and countless birds that all flocked to the watering hole to quench their thirst. With snowcapped Mt Kenya at a distance this surreal setting was complete. To describe Kenya just by what we saw would not be doing justice to the country. Think Kenya and a cacophony of bird sounds come to my mind. It was loud and it was shrill but it was an unbelievable variety of sounds that could keep you engaged for hours. With a game drive in the morning and early evenings, we were at leisure to spend the rest of the day relaxing and observing the animals going about their everyday activities. Our meals were constantly interrupted and yes, it was a welcome interruption as we would run out to see animals at the watering hole. elephants, water bucks, gazelles, rhinos, impalas, baboons, buffalos, ostrich and more, but none of the big cats. Eager to see more we chose the option of going on a night game drive, which apparently is possible only in the Ol Pejeta conservancy. While a day game drive is about the sights you see, in comparison a night one if about the sounds you hear. You get this eerie feeling that you are being watched and watched very closely! We encountered our first simba (lion in Swahili) and needless to say we were thrilled. The minute a big cat is spotted the excitement is palpable. Like happy children we returned to our cozy tents waiting to get under the sheets made warm by hot water bottles tucked into them. Barley had we slept and it was already time to head out for our next game drive. A new day brings with it a new vigour. That evening we had lady luck beaming down on us as we not only saw three cheetah attack a herd of zebra, but also came face-to-face with a pride of eight lionesses and their cubs sitting beside a pond. After hours of driving around we had finally got our moment with the big cats and it was worth every bit of the wait. Having spotted four of the big five, namely the lion, buffalo, rhino and elephant, we were on a hot trail to spot the elusive leopard, easily the most prized sighting on the safari circuit. If spotting animals grazing the grasslands was a treat, our next pit stop Lake Nakuru blew our minds away. Situated close to Nakuru town, the shallow alkaline lake plays host to one of the greatest bird spectacles on earth. The large concentration of algae attracts thousands of flamingos, giving the edges of the lake a pink tinge. Surrounded by bushy grasslands and acacia trees, the very Jurassic Park like setting plays host to a variety of animals, including tree climbing lions. But this time around it was not the simba that stole our hearts, but a herd of fifteen giraffe. The setting was perfect. Low lying hills rising out of verdant green acacia forests set against a pristine blue sky. These magnificent creatures emerged from a cluster of trees, crossed the open grasslands in graceful strides right in front of our vehicle and made their way to the lake. This spectacle would be etched in my memory forever. Having seen so much we were curious to see how our last pit stop and really the queen of Kenyan national parks – Masai Mara – would be. Getting to the Mara is a task in itself. The roads are quite bad and it’s just the sheer thrill of getting there that keeps you motivated till the end. As we drove past extinct volcanic mountains and stretches of bare land, you know you are approaching the Mara as Masai settlements start to appear. A typical settlement consists of a cluster of mud huts protected by a fence of thorn shrubs. Against this stark landscape specks of red stand out. As we got closer the specks turned out to be Masai men and boys clad in traditional gear, armed with a spear or knife, grazing their cattle. The number of cattle a Masai owns signifies their wealth. Outside the gates of the national park, as our driver was completing some formalities, a group of Masai women descended on us. If you think docile, shy tribal folk is what you are dealing with, think again. These Masai women speak fluent English and even bits of Gujarati! They are out there to make a sale and do not take ‘no’ for an answer. It’s not Kenyan Shillings that they are after but American Dollars! We were a little surprised by this commercialism out in the wilderness, but perhaps it is a side effect of the massive tourist numbers that the Mara witnesses year after year. 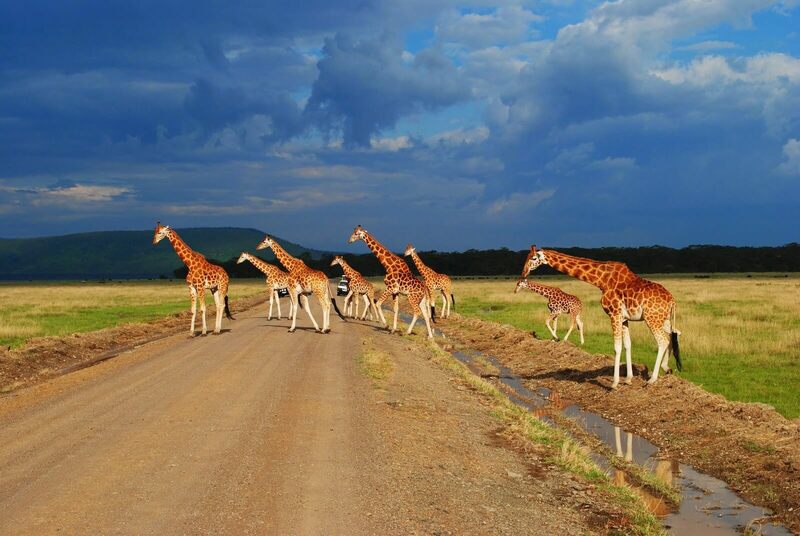 Once inside the national park, the acres and acres of undulating grasslands and the azure sky take over. We were most eager to spot the leopard that had lived up to its reputation of being the most elusive of the big cats. Luckily, a leopard had been spotted that very afternoon. A magnificent specimen sat high up in a tree, deep in slumber, completely oblivious to the carnival of tourist jeeps and vans that were circling it. Everyone wanted a better view and to get just that little bit closer. The Mara fulfilled our every desire. We saw solitary lions, lone lionesses, prides of lions and more. We even drove into a herd of hundreds of wildebeest, possibly making their trek back to Tanzania – the last leg of the great migration that the two countries play host to every year. But every experience has that one moment that stands out, and for us it was our encounter with the cheetahs on a chilly morning as the sun was coming up. Our driver was informed over the radio about three cheetahs that were sighted. As we reached the spot and turned off the engine, little did we know that we were right in the middle of their path. The three majestic creatures just ambled alongside our car, completely unbothered by our presence. They walked on and out of our sight, while we just stood there speechless at the sheer beauty of these creatures and reveling in the magic of the moment. Name the animal and we saw it. In fact we saw so many animals that we didn’t even know existed. Kenya to me was not a biology class but a life lesson on how our planet probably was before man started to take over every inch of it. Thankfully there are a few places left on earth that bear testament to the beauty of life and of creation itself. This article was published in The Hindu Metro Plus on the 6th of March 2011. Beautiful. Your words flew me to Kenya! Nice pictures too. Thanks Renuka! Glad my writing evoked those feelings.